fifteen. He soon began studying music theory and composition with Ronald L. Hill, the band director at Dallastown Area High School in York County. He became involved with the music programs in high school, where he was a member of the marching band, concert band and the jazz band. He played in the pit orchestra for the production of the musical Guys and Dolls. Jeff began his teaching career at Stringed Instrument Repair in New Freedom, PA in 1986, and at Campbell’s Music Service in York, PA in 1987. 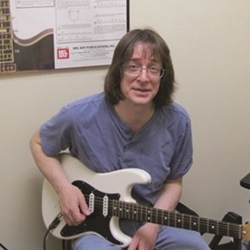 He teaches all levels of rock, jazz, blues and country guitar. He encourages each student to pursue the genre of music that interests them, as well as introducing them to the styles of guitarists, who may reside outside the student’s current listening preferences. Jeff has performed throughout Pennsylvania, Maryland, Delaware, West Virginia, North Carolina and Washington, DC. The groups he has played with include: Kasper, The Harry Traynham Band and Alaska. He has opened for nationally known acts including The Guess Who and The Badlees. He has recorded with a diverse group of musical artists such as: Kasper (Just Another Nightmare, Pop Rock 1987), John McNabb (Peace of Mind Beach, Contemporary Christian, 1992) and Edgar (Conversations, Jazz Fusion, 1996). Recently, Jeff has been working with the progessive rock band AudioJoe, recording the guitars and synthesizers in his own 24-track studio.